Dorset is a county in the UK that has a rich maritime history which is hardly surprising as it is edged by waters of the English Channel. The county boasts 140Km of beautiful coastline which features some incredibly popular holiday resort towns like Lyme Regis and Christchurch. It is a coastline filled with sandy beaches edged by stunning cliffs. This is a part of the Heritage Coast which starts at Poole Harbour, believed to be the biggest natural harbour anywhere in the world and goes on through the Purbeck Coastline with its nature reserves and country and marine parks. The pebbled beach located at Chesil Bank and the Abbotsbury Swannery are just a couple of the highlights as you work your way along the coastline. Dorset is a county that although filled with all things contemporary also has close links to the past, and a long history of which it is very proud. The landscape has changed very little over the last couple of centuries, perfectly formed neat fields are edges with ancient hedgerows bordered by winding country lanes. It really is a truly perfect pastoral landscape that you never tire of exploring. To the south and east of the county are the Cranborne Chase and the Dorset Downs both of which have rightfully been designated areas of natural outstanding beauty. This part of the county is just perfect for walking and picnicking. Cranborne Chase used to be a royal hunting forest which used to draw poachers and smugglers from miles around, a means of employment not to be taken lightly as the poaching of the royal deer was punishable by death. 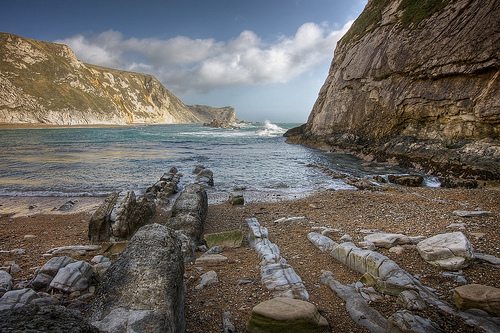 The county of Dorset has many villages within its boundaries which you should explore. They are filled with beautiful cottages built from sandstone, often the old coaching inn remains having been converted into the village pub or tea rooms. Pay a visit to Cerne Abbas and you will discover ancient houses that date back as far as the fifteenth century, as well as the remaining abbey ruins. There is much for the visitor to do in Dorset. For those with excess energy to spare there are not one but two dry ski slopes. The beaches and waterways lend themselves to sailing, wind surfing and diving, as well as the more relaxing past time of fishing, and for the less energetic there are a number of excellent golf courses on which you can spend the day. The countryside lends itself very well to horse riding and cycling as well as rambling. The two main towns of Poole and Bournemouth are filled with a host of entertainment venues from restaurants to nightclubs and the county is rich with museums including The Tank Museum at Bovington and The Royal Signals Museum at Blandford. Plus many of the smaller towns will also have their own local museums which offer a glimpse into the regions past. For those with a love of history and grandeur there are a number of stately homes and historic country houses that you can visit as well as beautiful gardens that you can explore.